Cisco routers are everywhere that networks are. They come in all sizes, from inexpensive units for homes and small offices to equipment costing well over $100,000 and capable of routing at gigabit speeds. A fixture in today's networks, Cisco claims roughly 70% of the router market, producing high-end switches, hubs, and other network hardware. One unifying thread runs through the product line: virtually all of Cisco's products run the Internetwork Operating System, or IOS. If you work with Cisco routers, it's likely that you deal with Cisco's IOS software-an extremely powerful and complex operating system, with an equally complex configuration language. With a cryptic command-line interface and thousands of commands-some of which mean different things in different situations-it doesn't have a reputation for being user-friendly. Fortunately, there's help. 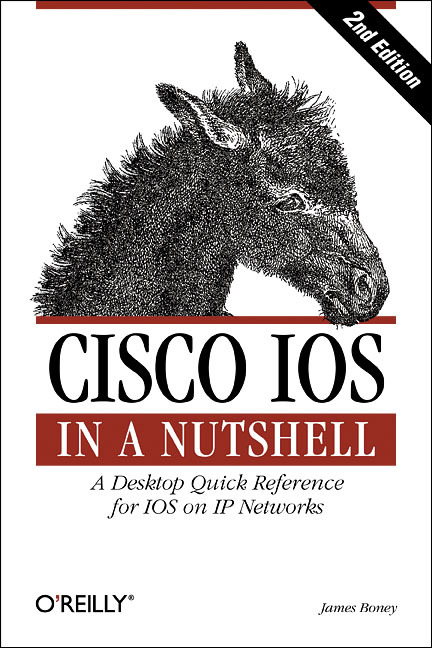 This second edition of Cisco IOS in a Nutshell consolidates the most important commands and features of IOS into a single, well-organized volume that you'll find refreshingly user-friendly. This handy, two-part reference covers IOS configuration for the TCP/IP protocol family. The first section includes chapters on the user interface, configuring lines and interfaces, access lists, routing protocols, and dial-on-demand routing and security. A brief, example-filled tutorial shows you how to accomplish common tasks. The second part is a classic O'Reilly quick reference to all the commands for working with TCP/IP and the lower-level protocols on which it relies. Brief descriptions and lists of options help you zero in on the commands you for the task at hand. Updated to cover Cisco IOS Software Major Release 12.3, this second edition includes lots of examples of the most common configuration steps for the routers themselves. It's a timely guide that any network administrator will come to rely on. Jim Boney has worked for the last eight years as a consultant specializing in a wide variety of subjects: network design, network management, Unix administration, and programming in various languages (Perl, Java, Tcl/Tk, and C/C++).For the last three years, he has been working on the vLab project, which allows complete access to Cisco routers over the Internet. View James Boney's full profile page.